Your home customized YOUR way. Choose your home style and floor plan. Rock Creek Villas are designed for comfortable living. ICK THE WALL COLORS YOU want. Select the flooring YOU want. Would you rather have a sewing room than a spare bedroom? No problem. Tray ceilings for an elegant look? Vaulted ceilings ? At Rock Creek Villas, it’s YOUR home. You decide. YOU WILL NOT FIND a better-built, more efficient custom home, in a 55+ golf course community — built YOUR way — for the price, anywhere around. 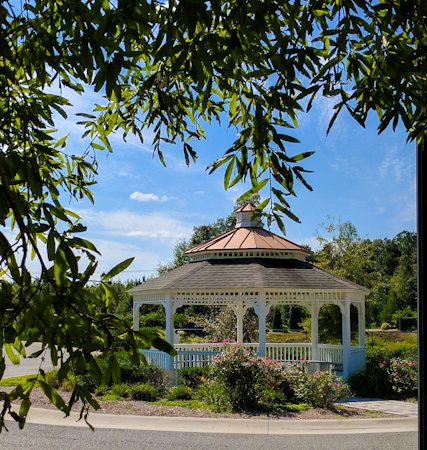 We have created a master-planned community in a safe, quiet, gridlock-free emerald oasis between historic Williamsburg and Richmond, capital of Virginia’s Commonwealth. HAND-CRAFTED HOMES. We build our homes for you at Rock Creek Villas the way we would build them for ourselves. We hand-craft nearly every inch of your home, right here on your lot in peaceful, quiet Quinton, Virginia. We’re very proud of that. YOUR NEXT HOME IS RIGHT HERE. We build ’em, and we sell them. However, we are only building a limited number of homes at Rock Creek Villas. Choose your lot, your homestyle, and floorplan. FREEDOM INCLUDED. No outdoor maintenance at Rock Creek Villas – we do it all. These all-brick homes are solid and efficient. Your beautifully landscaped yard and grounds are maintained year-round. So just sit back and enjoy what you’ve earned…freedom to enjoy your life. SO MUCH TO ENJOY – RIGHT HERE. Outdoor recreation is all around you – fishing, boating, bicycling, canoeing, nature and walking trails. More golf courses. You are surrounded by history, romantic plantations, and endless opportunities to enjoy the best of what Virginia has to offer. Not to mention our mild temperate climate and friendly people. CONVENIENCE INCLUDED. Dining, medical, pharmacy, grocery and more in your immediate area. Even more shopping and fine dining just a short drive away. Williamsburg abounds with outlet stores. The beautiful Virginia capital, Richmond, is 20 minutes west. The beach is in reach. WHAT ARE YOU WAITING FOR? Everything you want is right here! FREE Custom Kitchen Design AND POA maintenance fee paid for 6 months on contracts written by July 1, 2019! Maintenance-free villas designed to age in place, with customizable floor plans and solid, old-fashioned craftsmanship. So many things to do, you will wonder how you will ever have time to try them all. Or . . . just relax. Staying active in retirement is so important. The homes at Rock Creek Villas provide a home environment which is safe and will keep you functioning independently. People move to an Active Adult, 55 + Community because they want to stay active. Yard work and exterior home maintenance have been eliminated for the homeowner in these communities, leaving you time to enjoy fitness activities, hobbies, recreation and socializing. Active Adult Communities focus on these benefits. The most important aspect of an Active Adult Community is providing a home that will enable its owner to function independently ~ and safely. Of all the Active Adult Communities which I have visited, Rock Creek Villas is #1 in meeting this important criterium. The homes at Rock Creek Villas are designed so that the environment of the home can easily adapt to meet the owners’ changing needs over time: The entrances to the homes have no steps or thresholds, and doorway clearances are wide enough to ensure safe passage throughout the home. The rooms and hallways are open-plan, and provide plenty of space for safe maneuverability. Light switches and electrical outlets are positioned so that they are easy to reach. Door and cabinetry hardware is easy to use. Appliances have been set at a level so as to be accessible from a wheelchair. Everyone is so friendly, it makes living in Rock Creek enjoyable. It was a blessing that I moved to Rock Creek. I feel so safe and I love my new home. The all brick homes are well built – like in the old days with sticks and bricks.